Shredders are one piece of garden equipment that people either can’t see the point of or wouldn’t be without. Now that many localities have ‘green waste’ recycling a lot of gardeners are happy to part with their assortment of woody clippings from bushes and trees, leaving just the green stuff for the compost heap. 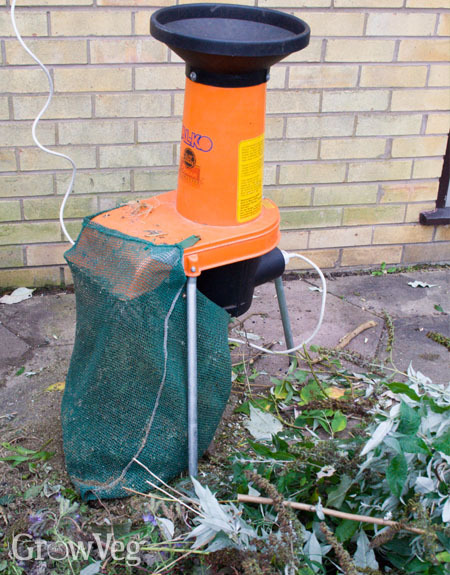 However, for those who want to generate high quality compost a shredder can be important. But are they worth the effort? The compost is produced much more quickly, often in under four months. The compost is well balanced and often of a higher quality, particularly as nutrients don’t have much time to leach out of the heap. Perhaps most importantly, the higher temperatures kill off weed seeds so that sterile compost is produced. A large enough volume of material, all ready to be composted at the same time. Generally a 1m cubed (3ft cubed) compost bin needs to be filled. The correct mix of green material (nitrogen-rich), brown material (carbon-rich) and water (just damp and if squeezed will stick together slightly). It is the second and third requirements that make shredders invaluable: they chop the brown woody stuff into tiny pieces, meaning that the air and bacteria required to get hot composting going are able to act on far more of the surface area of the material. This gets things cooking at much higher temperatures than traditional methods. They are slow to use. In order to make them ‘safe’ for household use they have to have a small inlet that hands can’t get into. So small in fact that very few branches will fit either without much pushing, cutting with secateurs and poking with a stick. It’s particularly bad with bushes that send off little branches in every direction. Getting these into the inlet is no small task! They jam up. This may be partly because my shredder is not the latest-and-greatest model but I find that after a while the shredded pieces don’t clear from the exit chute and it grinds to a halt. This mostly happens when I put too much green stuff through without balancing it with enough dry brown material. Once jammed, it has to be disconnected, a spanner used to undo the retaining bolt, opened and cleaned out before starting the whole thing again. They are awkward. Goggles and earmuffs are essential to protect yourself from the odd flying bit of material and the terrible racket they make banishes anyone else from the area (less of a problem with the ‘quiet’ shredders I guess but I don’t imagine that they are really that silent). Last weekend I trimmed two bushes in my garden. One is a buddleia which needs a lot of cutting back and the other needed to be halved in size. After just over half an hour I had the bushes trimmed and the material ready for the shredder. It took a further three hours to reduce this to shredded material, mixing in various weeds and other old plants. At the end of this process I had produced enough material for just one hot composting bin. I’m quite proud of the result but the whole process felt like I was fighting the shredder to get the job done. Was it worth it, spending three hours of the weekend that I could have had with my wife and kids? Perhaps, when I spread the compost on new young plants next Spring I will say it was. But part of me wishes I had just sent it all to the green waste recycling. There must be an easier way...! "Good shredders are quiet (yes, really, you certainly don't need ear defenders)and powerful and don't jam. They are also expensive. An alternative is to hire one occasionally. Our local compost promoting group, Compost Works, hires out shredders for £10 per day, meaning you don't have to fork out a fortune, nor do you have to store it. I'm sure many people will find similar organisations local to them (Compost Works is in the Leatherhead area of Surrey). Partnerchip is another organisation in Epsom, Surrey. " "Now that I would do - hiring a good shredder sounds perfect. I'll have to investigate whether we have a similar organisation up here near Liverpool. Thanks for the advice!" "A bagging mower can do almost the same thing. At this time of year, when my Long Island, NY garden is covered with a carpet of dead leaves, I run the mower around and it chops and bags the leaves. Perfect for the compost heap!" "I have the same reservations about shredders that you have expressed, and so far this has put me off buying one. Are there alternatives? I would love to know if anyone has found another way. For example, chopping up branches with a machete or an axe on a block of wood? Or pounding them in some way? I have to say I begrudge sending any compostable stuff to my local authority composting scheme if I could make compost with it at home!" "I live in France with 2.5 acres to look after, I love my/my neighbours shredder, the thicker branches I shred for spreading on the borders for help with weed control. I haven't started a compost heap yet (only been here 8 months) but fully intend to very soon, so the shredder will come in very handy, it's very quiet too so I can listen to my French Language cd's while I'm shreding "
"Hi, I think they are great! we moved into a house where the hedges and few plants had had no tlc for years. Hubby and son spent days trimming them (and other overgrown plants) while I shredded them! Yes it took ages but I got 3 cubic meters of compost, which I have since turned. It was a good family experience and I am proud of my heap. Just waiting to use it now! Hubby would have spent hours taking it to tip, skips are very expensive here. Result -v cost effective!"